Did you know that degenerative valve disease is a very common problem in dogs? Approximately 7 million dogs in the United States are estimated to have cardiac disease; the majority of those dogs suffer from degenerative valve disease. 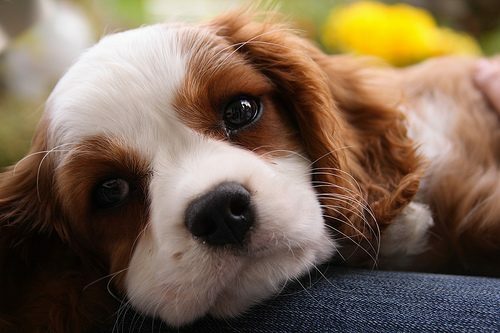 Small breed dogs, including Cavalier King Charles Spaniels, Poodles, Terriers, among others, are most commonly affected. Currently there is no medical cure. Degenerative valve disease causes the mitral or tricuspid valve leaflets to become abnormally thickened. This hinders the valve's ability to form a tight seal between the atrium and ventricle. As a result, blood in the ventricle now flows back into the atrium through the leaky valve (known as regurgitation) instead of moving forward from the ventricle into the aorta or pulmonary artery. The condition is progressive and over time the valve will continue to degrade until the heart can no longer compensate. The result is congestive heart failure, a condition in which edema fluid fills the lungs. Medical therapy can help control the clinical signs, but eventually most dogs die of the disease. Medical therapy for severe degenerative valve disease is palliative at best in both dogs and in man. The definitive treatment for severe degenerative valve disease in man is surgical valve replacement or repair. Surgical valve repair options in dogs have intrinsic limitations and is not available at most veterinary specialty centers or universities. Transcatheter valve replacement is a potential new therapeutic option that avoids the limitations and complications of open heart valve replacement or repair. It would also be more accessible, less expensive and much less invasive compared to surgical repair or replacement. Ultravet Medical Devices, a veterinary medical device company located in Bohemia, New York, creates devices which are designed to treat common problems in veterinary medicine which are difficult to treat using current available treatments. The company was founded by George Kramer, a board-certified veterinary cardiologist who has been in specialty practice for over 25 years. The company is currently hard at work developing a transcatheter valve device which can be used to treat dogs with degenerative mitral/tricuspid valve disease. Ultravet Medical Devices performed a pilot study in 2013. The purpose of this study was to demonstrate that transcatheter valve replacement is a viable therapeutic treatment in dogs with degenerative valve disease. Three Labrador Retrievers with severe tricuspid valve dysplasia were selected for transcatheter valvular replacement. All three dogs had severe right-sided heart enlargement, large tricuspid regurgitations and heart failure. All of these dogs were on multiple cardiac medications that could not stop the worsening heart failure. An experimental, prototype transcatheter valve was designed and manufactured by Ultravet Medical Devices. The device was named the Tucker valve, after Dr. George Kramer’s dog Tucker who was one of the dogs in the study. The device was passed down the jugular vein under fluoroscopic and ultrasonic guidance, fixed into the apex at the right ventricle and deployed between the tricuspid leaflets. Intra-operative and post-op echocardiography showed marked reduction of the tricuspid regurgitant jet in all three patients. The Tucker Valve™ was successfully deployed into the right ventricle via the transcatheter jugular approach in all three dogs. The device resulted in significant reduction of the naturally occurring tricuspid regurgitation in all three dogs. This study shows that transcatheter valve replacement is possible in dogs and can dramatically reduce the amount of regurgitation. In addition to the Tucker Valve™ Ultravet Medical Devices also has designed a second valve device called the CoApt Valve™. Ultravet Medical Devices needs your help. It has recently launched a crowd-funding campaign through Indiegogo. Donated funds will be used to create prototypes of the valve and perform clinical trials with the eventual goal of bringing the device to market. The timing of this project is optimal for making a measurable and significant impact within the veterinary community. What makes their valve so unique is that it is a curative solution versus current standard medical management of the disease. It is also minimally invasive and much more cost effective and accessible than open-heart surgery. By having a more affordable option, Ultravet Medical Devices will be able to reach a wider patient population and make a solution to degenerative mitral/tricuspid valve disease much more attainable to dog owners everywhere. It is extremely important to Dr. Kramer and his team that they create a viable cure for canine degenerative valve disease and keep those dogs suffering from it healthy and happy, enabling them to live long lives with their families. Dr. Kramer is board-certified as a Diplomate of the American College of Veterinary Internal Medicine in cardiology who has lectured locally, nationally and internationally and published groundbreaking research on cardiomyopathy, novel interventional techniques and valve disease. A native of Long Island, Dr. George Kramer dreamed of becoming a veterinarian since he was a young boy. These 4 Dogs Outdid Themselves When it Came to Costing Their Owners a FORTUNE!